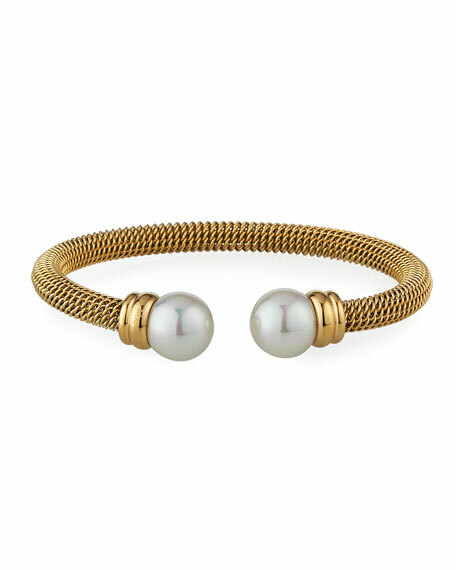 Slim enough to be stacked, yet striking enough to be worn alone, this Majorica bangle is crafted of gleaming gold curb chain and light-lauding pearls. Simulated simulated organic manmade pearl end caps. Curb chain wraps adjustable bangle. Adjustable opening for slip-on style. Ippolita bracelet from the Rock Candy® Collection. 18-karat solid yellow gold. Faceted and smooth cabochon bezel stations. Mix includes blue topaz, blue topaz and mother-of-pearl doublets, Ethiopian opal, and purple banded agate. Oval shaped for secure fit: Approx. 2.6"L x 2"W. Slip-on style. Imported. Ippolita bangle bracelet from the 18k Rock Candy® Collection. Organically shaped 18-karat yellow gold with signature hand-hammered finish. Five prong-set/four bezel-set stations: Swiss Blue Topaz, Amazonite, and doublets of Clear Quartz over Turquoise/Mother-of-Pearl. Oval-shaped for secure fit; Approx. 2.6"H x 2"W. Slip-on style. Imported. Senso™ Collection bangle bracelet by Ippolita. Handcrafted in 18-karat yellow gold. 28 round white diamonds. 0.68 total diamond carat weight.